Abscess: How Long Does it Take for an Abscess to Heal? How long does it take for an abscess to heal is people’s biggest concern after having an abscess lanced and drained. The time it takes for an abscess to heal depends on how big it is and how fast you heal. Sometimes it takes only a couple of days, sometimes it takes weeks. But first, let’s actually get to know all there is to an abscess so you can grasp a better understanding of it. 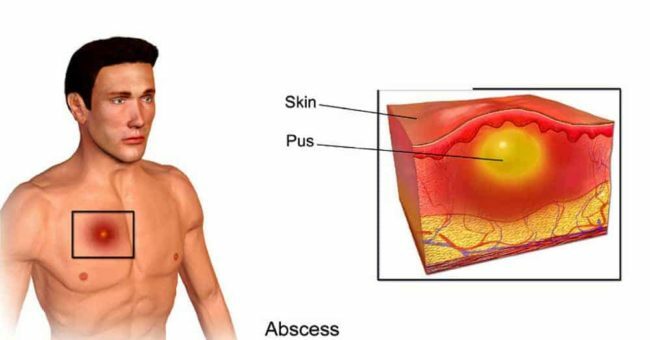 An abscess is an area below the outer layer of skin where pus (infected fluid) collects and forms a pocket of infected fluid with a thick wall around it. Most of the time, an abscess is caused by bacteria, fungi or other germs that get into an open existing wound. When bacteria enter a break in the skin/wound, an abscess appears. For instance, an abscess might develop when a hair becomes ingrown or when the skin is scraped or hurt with something sharp. Naturally, the body responds to bacteria multiplying inside the skin by building a wall around the area to prevent the bacteria from spreading to other parts of the body. The pocket will turn more swollen as the bacteria in it continue to grow. Even worse, some of the bacteria may break through the wall and cause an infection on other tissues around the abscess area or flow into the bloodstream and contaminate other body’s parts. 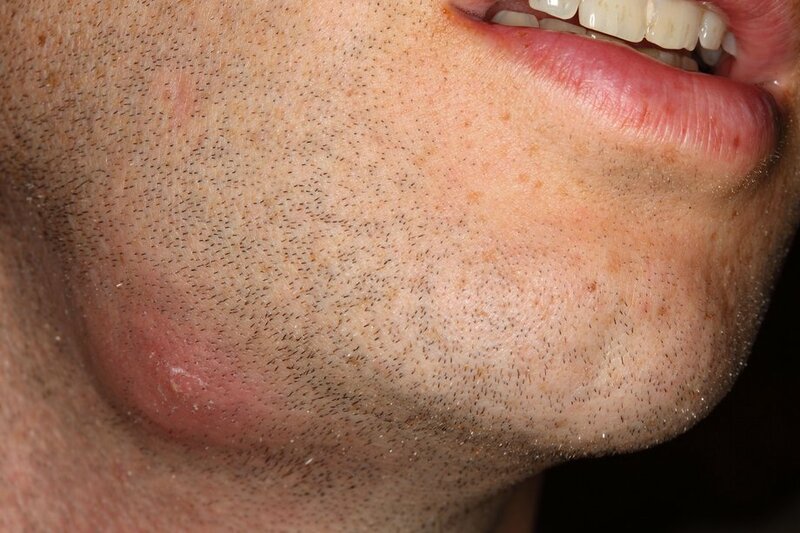 Normally abscesses occur when hair follicles or sweat glands get infected or after minor scratches or puncture injuries. Drainage of pus or other fluid. How is an Abscess Treatment at Home? You can’t really tell if it really is an abscess so you need your health care provider to examine the wound area. A sample of pus from your abscess should indicate what is the reason behinds your infection. A procedure called Incision and Drainage, or I&D is used to remove pus and fluid from the abscess. Your healthcare provider will make a cut in the abscess so it can drain. To help prevent the spread of the infection to other parts of the body, your medical personnel, as part of the treatment, will prescribe antibiotics. The thick wall around an abscess will not let antibiotics go through to fight the infection in it; therefore; the abscess itself needs to be cut open and drained out so that antibiotics could actually take effect. Gauze will be put into the wound to pack the pocket, it will be covered with a bandage (you should keep track of how many pieces of gauze are placed inside the wound). One end of the gauze is in the abscess and the other end is left sticking out through the cut in the skin. This allows the pus that builds in the abscess to drain out. The gauze packing needs to be changed every day or two. Your body will fill in the pocket where the abscess was with new tissue. Once the abscess is filled up, the packing will be taken out for the last time allowing the skin to shut and heal. Do not put too much packing in the wound and do not pack the gauze too tightly in your wound, otherwise, it could badly affect your recovery. Sometimes, surgery could be needed to remove your abscess. Your doctor may do this if the abscess is on your hands or buttocks. Surgery can lower the risk of an abscess coming back. Remember that you should not open or squeeze out an abscess by yourself. This can make the infection much worse. How Long Does it Take for an Abscess to Heal? An abscess should take a few days to heal completely. The doctor should ask you to return to have the packing removed the next day or two–or if it’s small, he may suggest that you remove the packing yourself and the “hole” will eventually close up. The wound is healed from inside out–if it’s closed (sutured back or taped back into place) the moment after it’s lanced, space will most likely be filled back up, and it will have to be popped open again. The healing process depends on how long it takes for all the rubbish to come out and how deep the abscess is. If the root of the abscess is left, it will continue to fester. Make sure that you take the antibiotics as prescribed and do as the doctor advised you. Take pain relief medication as prescribed on the packet to help lessen the pain also. It probably will remain swollen for several days, but everyone is different, so no one can say for sure how long the healing process will be. What Can You Do to Take Care of Your Wound? As we can’t tell how long does it takes for an abscess to heal fully for sure, here are some good pieces of advice to make the recovery faster. Follow your doctor’s instructions for treating the wound at home. If he allows it, remove the bandage and gauze packing carefully. Clean your wound and the area around it as instructed. Dry the area and put on new, clean bandages. Change your bandages when they get wet or dirty. If the gauze pops out before it is supposed to, you may need to visit your doctor to have it fixed so the skin does not close too soon. If your doctor prescribes antibiotics, take them exactly as you are directed. Put a warm gauze on your abscess. This will keep it open and drain. Apply the warm gauze (not too hot) for 10 minutes. Repeat this 4 times a day. Try not to press on an abscess or open it with a needle for you might push the bacteria deeper into your blood and worsen the infection. Wash your hands often to help prevent the spread of germs. Use soap and water or an alcohol-based hand rub. You need your hands clean when taking care of the abscess at home. Just got an abscess lanced on the left side of my scrotum. PA told me to come back in 2 days (currently 4/8/2019) so I’d be going back 4/11/2019. It’s a few good hours after it was nicked open and thankfully it’s not oozing much anymore besides just bleeding. I go back for stitches on my follow-up and hopefully this will be the last I have of this issue. I should also note this happened before in Oct of 2018 and I was just needled and drained. It did go away for a while but resurfaced in the exact same place four days ago the size of an egg. From what she said, all the cysts were popped and appeared to do well. I’m having an abscess on my back for more than 1 week, and haven’t visited doctor yet. I just applied the creme called Thiobitum to open the abscess and drained the pus out by my fingers ( I didn’t know I shouldn’t do that). Now I uses bandage to cover the wound and change twice/day, no more pus but (thick) blood still comes out. The pain is less than when it was not open but remains unchanged for several days. Is it normal? I will still go to see doctor anyway. Got an abscess incised in September, it was huge and super infected. By Mid-October the incision hole was closed but it became infected and I took antibiotics for 10 days and it became normal again and healing. Now it’s end of December, the place where the incision was and where the abscess were are very dark coloured (dark purple). No pain, no lumps, no redness, is this just scarring? Will it go away? Getting worried because it’s still discoloured. Can I use a sterile cotton gauze pad to repack my wound it’s almost healed I think I need 1 more packing I don’t have the strips they used when is this packing supposed to come out? After pus removed, there is a big hole in hip, how long it takes to cure? . How long it makes pain? I had a large abscess removed over a month ago. Went every day for repacking and new dressings for 3 weeks as they kept saying it was still draining. Finally they stopped putting the packing in. I still have a hole two weeks later. I called the doctor and they said the hole could take up to 2 months to completely close up. The doctor told me to take collagen, Zinc and Vitamin C to help speed up the process. I have an abcess on my stomach that was drained 8 weeks ago, i am still packing it with strips, but have lots of brown drainage, the opening of the abcess looks wider, mine is due to crohns, its been 8 weeks, still is painful, also have astomey bag just to right of this horrible thing! Seems like forever to heal! I eat lots of protein, 3-4 servings a day to help with the healing, i had one 2 years ago on the lowest part of my buttocks, i dont recall healing taking this long! Well, maybe it wasn’t as deep! For wound healing take high dose vitamin C and zinc besides the protein. If I were in your shoes I would get an appointment with a doctor, just to make sure the abscess isn’t caused by a fistula. Awesome article. You provide here all the best beauty tips. I really like to read your article. I had an abscess on my bottom lanced sept 2016 I was pregnant at the time. A month later it reformed and relanced. It’s been 2 years and it’s still oozing stuff out. I’ve had an abscess on my buttocks just before the crack starts (superficial to my coccyx). And the day I had it cut open was on the last couple days in June. I’m still having it packed to this day (9-4-2018) and I’m scared its causing permanent damage. It still oozes out a little, I just really want to make this healing process go faster. It took over my summer an now its eating up my school days. Plz Help. You might want to use manuka honey to treat your infection. It has natural antibacterial qualities. Good luck! I had an op at the beginning of July on a large abscess in the same area – it’s still healing. I’m just having to be patient – it’s taking soooo long! I had a large abscess removed from my back on 10/28/18 Went every day for repacking and new dressings for 3 weeks as they kept saying it was still draining. Finally they stopped putting the packing in. I still have a hole two weeks later. I called the doctor and they said the hole could take up to 2-3 months to completely close up. The doctor told me to take collagen, Zinc and Vitamin C to help speed up the process. I had some abscesses cut open in my armpit. Two of the areas are hard and itching(hopefully this means it is healing?) The third is right beside the second and it is softer then the hard two it also itches. But I dojt understand why two are hard and one is soft. Its not that soft tense like when I had the infection and it doesnt hurt so i don’t understand. Please get back to me. Thanks for sharing all this information about wound healing and use of wound care dressing. I did an abscess surgery on the 5th Feb 2018 now I’m on VAC machine since than my wound is opened so I was wondering what can I do to help with the wound closing to be able to get off the VAC MACHINE.Thanks hope to hear from you soon. My Father In Law had a knee replacement surgery. Less than a year later he got cancer in the same leg right above his knee. He died not long after. They say it’s not connected, but it sure seems strange to me. I would have it changed immediately.